Attack and decay slope controls. 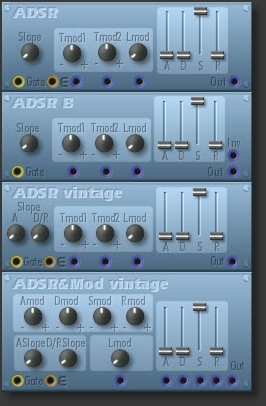 ADSR + ADSR B have one slope control for attack, decay and release. 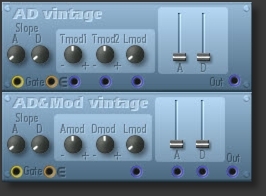 two T(ime)mod inputs, L(evel)Mod input. 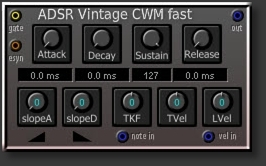 ADSR Vintage CWM fast has TKF, TVel and TLev mod inputs. A,H,D inputs: (async) connections to modulate attack, hold, decay times. Inv output: inverted Envelope signal. No Esync output. Can be used in situations where it is not important that the envelope output returns to zero before it is restarted. 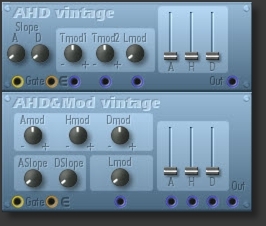 Similar to ADSR vintage, but with faster Attack time and TimeVelocity.